More than 237 years ago, the Marine Corps was born at a bar in Philadelphia’s Tun Tavern. No matter: top brass is getting serious about squashing binge drinking. 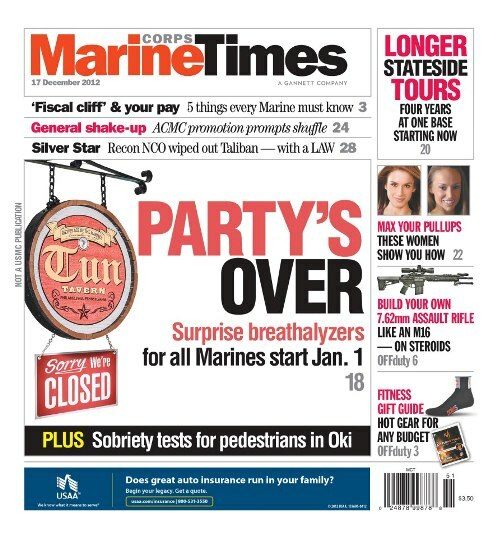 This week’s Marine Corps Times cover story focuses on the service’s new initiative: requiring surprise breathalyzer tests from Marines on duty. They’ll get them most frequently when they show up to work in the morning, and face additional testing, alcohol abuse counseling and other consequences if they’re identified as binge drinkers. This is the latest piece to the Corps’ war on alcohol abuse. As Marine Corps Times reported in August, the service is developing an alcohol-abuse campaign plan, citing booze’s involvement in suicide, domestic abuse and other societal problems. This week’s print edition also includes stories about the Corps’ push for longer stateside tours, a look at how the service will shuffle its general officers and a feature on a reconnaissance Marine who earned the Silver Star for stopping a Taliban ambush with a M72 Light Anti-tank Weapon.